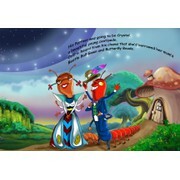 Illustrator experienced in children and adult book publication. Caricaturist and graphic designer and also expert in logo designs. "Currently working with Sidao on a children's book. Main character has been designed and going well." "Great job produces images quickly and quality"
"I needed images to take my stories to the next level towards publishing. Sidao reacted quickly to the text and was very intuitive and expressive of the sentiments in the stories. He also adapted brilliantly to any changes I suggested. Thank you, Sidao, ..."
"Sidao created the best designs in our contest and was really on-target conveying our message. He was also the most accurate, responsive and communicative about edits. " "Working with Sidao "our" chosen designer was a blast. From the very beginning Sidao was so very motivated, so creative, so talented and really understood our complex project and need for really unique Illustrations. He reacted fast and precise on all in..."
"Sidao did an excellent job with my logo! A very talented designer, and highly recommended!" "Sidao is a winner for us because of original style, understanding of our brief, and reliability. Most importantly, of the 64 designers we worked with Sidao was the only one that incorporated our brand into the design seamlessly from the start, the other..."